Okay I did the first test on 1.0.5.6 with a Prop set and got mixed results. The "/" issue definitely seems to be fixed. The issue with ' and () in the DIM zip filename seems fixed also. It happens with Props or Wardrobe items. I don't get the missing "d". You may be doing it a different way then me if you could give me a list of steps leading up to the problem that would help a lot. But I will look into it some more. No special steps required to reproduce the problem. I did a Clothing set and made screen captures at different points. The first is with all areas filled and ready to click the Update button. I filled each section from the top down. Thumbnail image and Artist were set first. The area with the Missing "d" is highlighted with yellow. The second image I completely restarted the Product from the DIM tab to make sure nothing influenced the result. In between the 2 I closed CDDS and then started a new instance. 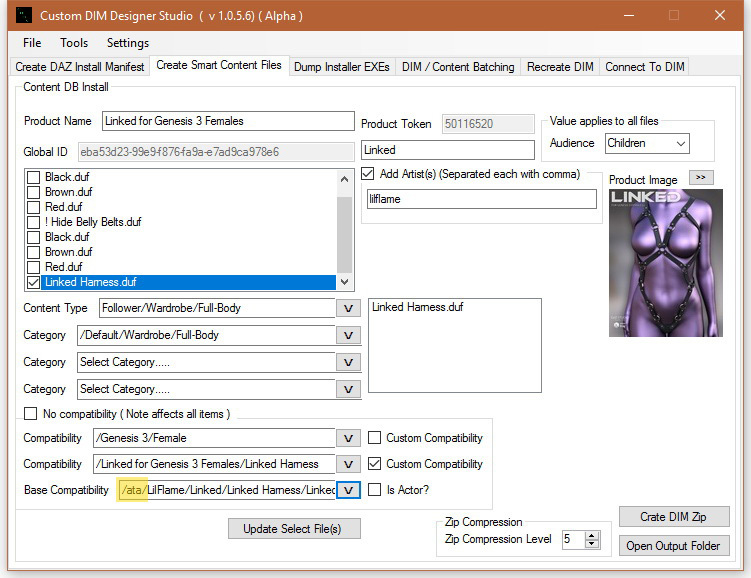 First I ticked the Custom Compatibility box and then used the suggested setting from the Popup. Second I clicked the "V" for Base Compatibility, loaded Daz format files and selected the appropriate geometry file. Once again the area with Missing "d" is highlighted in yellow. I did the the same steps as you but I don't get the missing "d". Maybe it something to do with the OS you running what OS do you run? From the images it look like 8 or 10. I just tested it on 10 and still no missing "d" so I don't know why your "d" is missing. Even thought I don't know reason why this happening I can put a check in to fix it. Yeah I'm on Win 10. Very strange issue indeed. Just leaving for lunch so I will check the new version in a couple of hours. Thanks! Yes, very strange like I said it works on my PC running 7 and my 10 PC. But computers are like that what works on one PC may not work on another PC. Anyway 1.0.5.7 should fix the problem (whatever it is). @Admin wrote: Yes, very strange like I said it works on my PC running 7 and my 10 PC. But computers are like that what works on one PC may not work on another PC. I guess you can put in a check to make sure the Compatibility is set before Base Compatibility. System.IO.IOException: The process cannot access the file 'Prison Showers.png' because it is being used by another process. Also noticed the Content path was changed? This is error was caused when CDDS deleting the temp files. For some reason it was still being used. I'll get that fixed. The Content path in the UI is the path to your working content. When CDDS is run for the first time or if you delete the settings file it defaults to the folder path where the CDDS.exe is. Found one more small-ish bug. 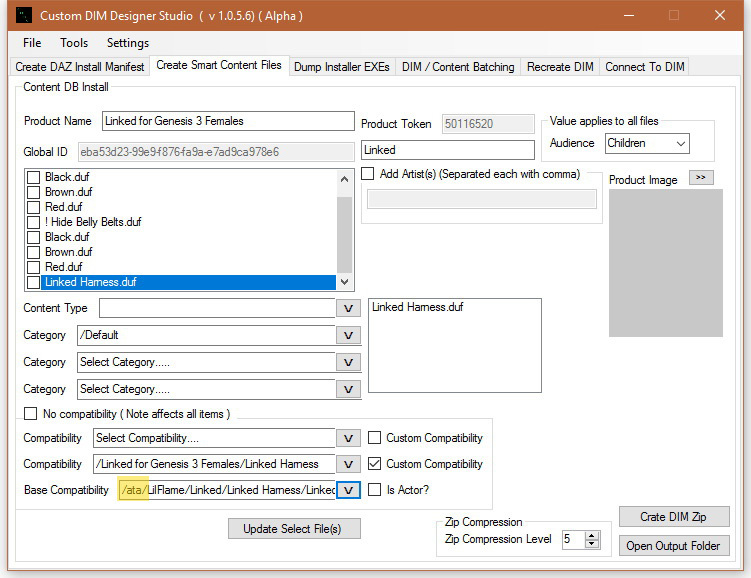 Filenames or Folders/Paths containing "&" need to have that changed to &amp; in the Manifest.dsx and in Runtime/Support/Storename_123456_Product_Name.dsx files. In DIM file it breaks the install and it fails with error. In Support .dsx file it will not cause DIM install errors but the Smart Content metadata will not be installed. Other than that it seems pretty good with the latest build. Thanks! The prison Showers was an original DIM file. With the older version, it was filling out the name, but didn't do it this time. Even though the 3 Daz files are in 1 of the sub folders for the smart content. Also, is it possible that when you open a ZIP file, to open the last used folder? seems like everytime it starts with the desktop. The last folder opened should be the folder that opens next time you load a zip. May do to you OS I'll look into it what OS are you running? 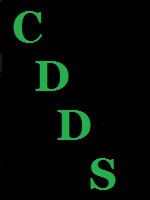 CDDS (1.0.5.7) Has just been upload with the small fixes. @Admin wrote: The last folder opened should be the folder that opens next time you load a zip. May do to you OS I'll look into it what OS are you running? the next time you run CDDS the path will revert to your documents folder on win 10. I don't use USB drive with it. I have everything on my F Drive partition. If you rename, move or delete the last used folder the next time you run CDDS the path will also revert to your documents folder.